Our services range from concept of electrical transformer design to drafting for all electrical systems (lighting, security, power and emergency power) within a building. We consider every detail of the electrical projects with the aim to ensure smooth start-up of your project and minimal field changes. We're team of your Electrical, Solar & Mechanical Desinger Consultant & Contractors based at Kolkata. We can & we will work out the best possible selection of ELectrical, Solar & Mechanical equipments required for your insuatry/ project. Technical Specifications of Components and B.O.Q. - Designing of Fire Alarm, Fire Fighting Systems, cctv, Music System, Telephone Networking and data cabling. - Designing of underground Cabling System for HT & LT Network. Elecon - Electrical Consultant in the business of providing electrical design consultancy to the client like Industry, Shopping mall, roadway lighting etc. We provde design of electrical distribution, making the specifications of the electrical equipment, making BOM for the projects etc. Our electrical engineers are master in rendering these Design Of Electrical Installation. The Design Of Electrical Installations services are provided by us to clients as per their specifications. 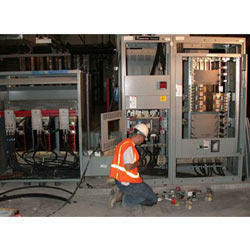 These Design Of Electrical Installations services are known for their hassle free performance. The electrical installation of your bulk storage and handling system can be incorporated into your complete turn-key package, giving you a single point of contact for all of your electrical, control and instrumentation requirements. Our company offers Electrical Design systems, which are equipped with earthing & lightening protection system as per Indian electricity rule and international standards. These electric design systems have a mode of operation & back-up time, which is customized as per the clients’ requirements. We are equipped in providing Electrical Consultancy Service across every sector. With over 25 years of Professional, Qualified and Experienced Electrical Advisor, Electrical Engineers and Support Staffs, always strive to give the very highest quality of outputs. We offers Consulting Services as per the client's specific requirements. Our team of professionals is skilled in offering these with complete adeptness and proficiency and is offering services like detailed planning, notice inviting tender, detailed cost estimates and feasibility study. We provides necessary technical expertise for design and consultancy for the modern power systems. Our services include electrical design and analysis for substation, power generation and plant protection for project builders and other industrial houses. Our drawings and calculations are supported with best available software’s like Etap 7.0, AutoCAD 9.0, etc. - Survey of Existing & Proposed LT & HT Distribution network upto 33kv with GPS instruments.